From the highly acclaimed author of Ninety-two in the Shade and Cloudbursts comes a collection of alternately playful and exquisite essays borne of a lifetime spent fishing. The forty pieces in The Longest Silence—including seven collected here for the first time—take the reader from the tarpon of Florida to the salmon of Iceland, from the bonefish of Mexico to the trout of Montana. They introduce characters as varied as a highly literate Canadian frontiersman and a devoutly Mormon river guide and address issues ranging from the esoteric art of tying flies to the enduring philosophy of a seventeenth-century angler to the trials of the aging fisherman. 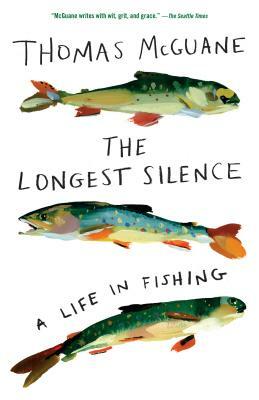 Both reverent and hilarious by turns, and infused with a deep experience of wildlife and the outdoors, The Longest Silence sets the heart pounding for a glimpse of moving water and demonstrates what dedication to sport reveals about life. Thomas McGuane lives on a ranch in McLeod, Montana. He is the author of ten novels, three works of nonfiction, and four collections of stories.